Now, to be sure, this is not all MEPs. As I said in my last MEP post, Hollywood MEPs are doing just fine. Milliman, Inc., a premier global consulting and actuarial firm, today released the results of its Spring 2017 Multiemployer Pension Funding Study, which analyzes the funded status of all multiemployer pension plans. As of December 31, 2016, these plans have an aggregate funding percentage of 77%, a 1% increase since June 2016. During that six-month period, the market value of assets increased by $17 billion while pension liabilities increased by $13 billion, resulting in a $4 billion-decrease in the aggregate funding status shortfall. But results vary by plan; while non-critical plans experienced an aggregate funding percentage of nearly 85%, the funding level for critical plans is under 60%. A closer look into how contributions are distributed shows that plans facing severe funding challenges only spend 38 cents of each contribution dollar on new benefit accruals, while 50 cents of every dollar goes to pay down funding shortfalls. Healthier plans spend 56 cents per contribution dollar on benefit accruals and 32 cents on funding shortfalls. The remaining 12 cents in both scenarios is spent on expenses. Note that it’s not necessarily the same plans in the critical and non-critical bins. They can be recategorized, and by definition, the critical plans are going to have lower funded ratios. John Bury has been keeping good tabs on MEPs in crisis, with his posts on those filing to cut benefits for current retirees under the MPRA being very timely. Quick recap: MPRA is the law passed “in the dead of night” (metaphorically) in December 2014, which allows for benefits of retirees of multiemployer pensions to be cut given specific conditions be met. To be sure, MEP retirees already have been having their benefits cut… if the plan goes officially solvent and the PBGC takes over the pension. The amount of guaranteed pensions for MEPs is much lower than that of single-employer plans. There may be other requirements, but I highlighted those four as they’re related to how the applications have been treated thus far. So far: five applications denied, one accepted. (I’m going to ignore withdrawals for now). Why were the five denied and the one accepted? Well, when the application is accepted, the government doesn’t have to explain anything. They just accept. But each denial comes with a letter. Let me do a rundown. Every one of the items mentioned reduced the benefit cash flows in the projections, and given that they were deemed unrealistic, this broke the requirement that they could show the pension was sustainable with the cuts. This letter was the first of the denials, and ran 10 pages. There were three high-level issues – that the cash flow projections were realistic, that the cuts were fair, and that members could understand the proposal in the material sent to them. I’m not going to address the fairness or communications issues, those these are both important. Entry age assumption unreasonable — too low, and a single number. Assumes that new participants to the pension wouldn’t be getting any benefits for at least 20 years. So there was an assumption the assets would throw off a lot more, and that the benefit flows would be less. So here they’re overestimating contributions, and underestimating benefits. Dear lord, 1983 GAM. Was their funded ratio calculated using 1983 GAM? This one is interesting — it’s not about the actuarial assumptions, per se. It’s that the pension applied for a partition of the fund, which was needed for this plan. And that partition was denied June 10, 2016. Given the projections were dependent on the partition, this benefit cut plan was denied. Before getting into this denial, I will note this was the second application for this plan, as the first was withdrawn and they resubmitted. I’m not going to analyze the changes between the two plans. With regards to investment return assumptions, part of the issue is that a flat investment return is seen as unreasonable — not merely that the level is too high. This is something all plans applying can take into consideration in their own application. Here are the application materials for the one successful application thus far, which I’m not going to look at right now, but will look at another time to see why they succeeded where the other five failed. A record number of multiemployer pension plans are receiving financial assistance from the federal government this year as the burgeoning ranks of retirees dwarf the number of employees paying into the plans. Multiemployer pension plans—which are plans in unionized industries where employers group together and contribute to a single plan on their workers’ behalf—have become the biggest drain on the Pension Benefit Guaranty Corporation, the federal agency that insures pension plans. The agency has said that its multiemployer program could be insolvent as early as 2025. Even as Congress has taken steps to solve the multiemployer pension problem, the plans continue to face a death spiral. 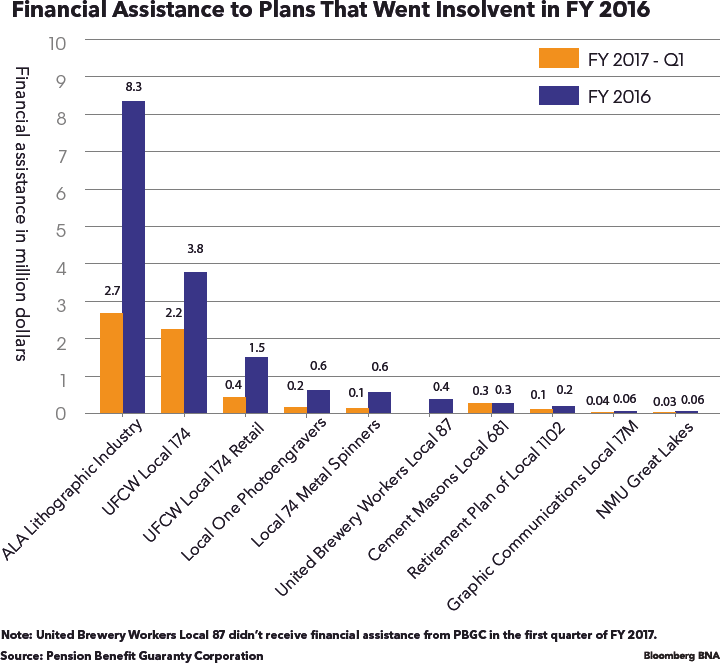 In fiscal year 2016, 10 multiemployer plans went insolvent and requested financial assistance from the PBGC. The federal agency is now giving financial assistance to a record-high 71 multiemployer plans. About $112 million of financial assistance went to troubled multiemployer plans in FY 2016, the highest amount in history, according to data Bloomberg BNA obtained from the PBGC. These 10 plans became increasingly dominated by retired and separated vested participants from plan year 2001 to 2015, Bloomberg BNA found after an analysis of Employee Benefits Security Administration Form 5500 raw dataset. As the number of active employees in each plan dwindled, the amount of money contributing employers made to the plans shrunk, ultimately leading to their insolvency. Seven of the 10 plans had no active participants since 2013, although five of the seven had more than 20 percent active participants in plan year 2001. NMU Great Lakes had no active members throughout the 15 years reviewed by Bloomberg BNA. Is MPRA Saving Multiemployer Plans? Congress attempted to prolong the viability of the multiemployer pension program when it passed the Multiemployer Pension Reform Act of 2014 (MPRA). The MPRA allows the “critical-and-declining” subset of red-zone plans to apply to the Treasury Department for benefit cuts. 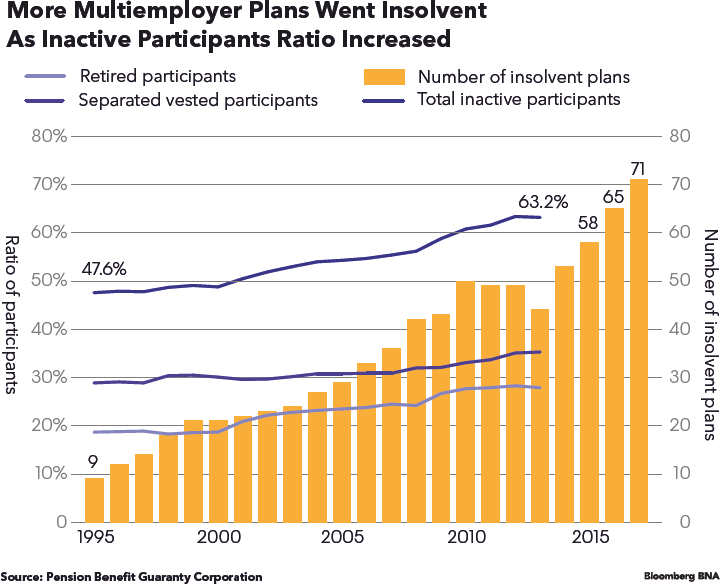 A plan projected to go insolvent in 20 years is also critical and declining if its ratio of inactive to active participants is more than 2 to 1, or if the plan is less than 80 percent funded. Plans are required to report its risk status in Form 5500, send notices to its members and submit its notices to the Department of Labor, when it becomes a critical-and-declining plan. There are 102 critical-and-declining plans according to the most recent data available, Aubry told Bloomberg BNA on May 3. That means these plans will do what they say: go insolvent in 15 or 20 years, if there’s no policy change, Aubry said. Is the MPRA helping prolong plans’ solvency by allowing them to cut benefits? Not yet, Aubry said. Only one out of the 12 plans that applied has been able to go through with the cuts, excluding the five withdrawn applications. In practice, at least for the plans that have applied, MPRA hasn’t been a solution, Aubry said. These have nothing to do with MPRA. None of these failures should have been a surprise to those who managed these plans. But it seems that benefit cuts probably wouldn’t have been able to save these plans, either. One thing I noticed as I was grabbing denial letters, was that people’s comments on applications were posted on 5/10/2017, which was news to me. It was like a blog comments section in many cases. I worked over 30 years to earn my pension and it takes every penny to keep a roof over my head. According to the research I have done, cuts can only be approved if doing so will allow the fund to remain solvent in the long term. If the fund will be insolvent in 3 years, how does cutting my monthly benefit in half extend the life of the fund to 30 or more years. According to my math it will not. The sad fact is this multi employer plan cannot be fixed. The plan needs to pay full pension benefits for the 3 or 4 or 5 years that it can, to the people that worked a lifetime for them, and then let the pension insurance take over at the reduced rate. That will allow the retirees at least 50k to 60k more dollars to try and salvage their retirement before they have to face the worst. Also, it looks like the members of this fund will be forced to sell their homes. At least giving us the 3 to 5 years it will take the fund to become insolvent will give us time to do that, without being forced to do so at panic or fire sale prices. I have not looked at this particular plan, but it can very well be that Mr. Lucian is correct. In some of these cases (not just the ones that filed, but other MEPs as well), the amount of cuts needed to make the plans sustainable would bring the benefits to below PBGC guaranteed amounts. In that case, there’s really no point to benefit cuts. I’m caught in the middle of this decision. I have not retired yet, but I could retire on an Early Retirement. I’ve worked over 30 years earning my pension with this Plan. If Treasury approves this application, I lose a large amount (29%) of my earned pension right away. I would never have a chance to be paid the full benefit I earned. If they don’t approve the application, I continue to accrue nothing towards my pension, but it’s not immediately reduced. However, once the Plan runs out of money, it’s turned over to the PBGC and my benefits would be reduced even greater than they would be under MPRA. This may not happen for years, but without intervention, it will happen. However, once Central States Pension (whose application from Treasury was denied) is turned over to the PBGC when it runs out of money, the PBGC goes bankrupt in 2025 (unless the Government steps in and bails them out). If our Plan runs out of money after PBGC goes bankrupt, we will only be paid a tiny portion of our benefits (which comes from any incoming money from employees still working split between all retirees). No matter which side you’re on, you must make a decision and vote. It seems to me having the money put in my 401K plan all along would have been better than into a pension plan that was not designed to bounce back from economic ups and downs. This is just a comment and not a vote and I will have to suffer with any decision made. It seems best to have some money for a longer period than a little more now. I am against this proposed 29% cut. We paid union dues and agreed to wage freezes for many years just to preserve our pension benefits for our retirement years. Now I am retired, single and this is my only source of income. I will not be able to meet basic living expenses with this cut. I think it is a real shame that hard working, responsible citizens are getting thrown under the bus when we are beyond our working years with no way to replace this lost income. Please don’t approve this plan! I am not in favor of a cutback. I worked over well over 40 yrs for employers who contributed to the Professional Employees Pension fund I worked, believing that I would have decent income built for my retirement years! I worked hard not to be a burden or stressed in my senior years. NO! I do not agree. This proposal is not a fair and equitable solution per your requirements. there are too many to list in this one comment. First obvious one, is that an across the board cut does not take into account the age of person, and how much time they have left in their life to re-coup. The time that they have already waited to collect their pension, as they may have been able to collect but have waited til the full retirement date. It does not take into account that the employers have been in the plan, and can PAD their contributions, thus they will not feel the effect of a 29% cut. Example, participants that had left the union perhaps 7 years ago and planned on retirement but were say age 54 when the 2009 notification of pension changes were implemented got totally hit hard and could do nothing because they were age 54. Now they may be 60 ish and have no time with reasonable health to go out into the working world finding a pension….. just screwed as compared to someone age 50 currently…….. Solution to make this fair would entail a age based solution, Not broad brush easy solutions. Employers in the plan should be sorted out and examined for the number of hours reported over the many years. As this sits, it does not fit the requirement for a fair solution. It already has been very unfair with pension rule changes. I vote to Leave this thing alone if you cannot fix it properly ! I’m sorry to say that many of the commenters, not only on this application, but others, will not take a hint from reality, and think that there’s an option where their pension doesn’t get touched at all. I tried grabbing the assets, and I found a bunch of reports suddenly missing. They were there at the end of March this year, but it looks like the PBGC has redone its website. I get a 404 for trying to grab the 2016 annual report. Maybe my timing is just bad. So, the MEP program is in fairly bad condition at the PBGC, and is currently projected to have a 50/50 chance of running out of cash by 2025. The MPRA is there not merely to try to get some of the MEPs to be sustaining, but so that the PBGC itself doesn’t run out of money. The Treasury isn’t interested in allowing for benefit cuts when the plans are just going to land on the PBGC anyway. Here I’m just dealing with the numbers. In a later post, I will deal with the politics.